It's been quite a year for indie/electro-pop duo Winters End, having recently completed their first nationwide tour of their home country, Australia. Due to the success of this, they hit the road again in the new year as support for Yossarian. Earlier this year Marissa and Christopher Pinto released their most acclaimed single yet in 'Mayfair', for which they've just unveiled a new video that hopes to raise awareness of domestic violence. It's a powerful and brave subject to tackle, but when you look at the stats they show at the start, a very worthwhile cause. 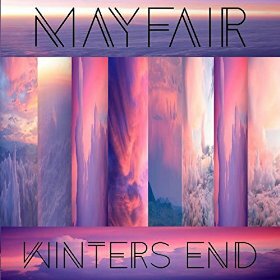 Musically, 'Mayfair' is awash with synths that mingle with a quaking rumble of drums and a commanding vocal. As it builds it almost becomes widescreen, clearly showing ambition to make a big sound, and the chorus begins to hit those heights. Guitars start to be pulled to the fore and those drums go from a gentle rumble to almost a gallop as the track picks up strength, especially after a short break adds to the atmosphere. Winters End have the kind of sound that could easily crossover to a wider audience given the right exposure, something that their recent and forthcoming tour schedule will help towards. They might be touring further afield before too long.